Thank you for visiting our Zurich airport transfer website. Switzerland Car Service offers Zurich airport transfer for passengers arriving and departing at Zurich Airport (ZRH). Private airport transportation service with limo, van or minibus for up to 8 people at very fair rates. For more informatioan about our transportation service you can check our infographic. Of course we are not the only one private airport transfer Zurich provider here at Zurich airport (ZRH) but we will show you how to find the best Zurich airport transfer company which suits your needs. It`s difficult for someone from abroad or for someone in Switzerland who orders a airport transfer to or from the Zurich airport for the first time, which private transportation company will be the best for their needs. You have a few options, that are a Zurich airport taxi, limo service Zurich airport or a private car service. There are many Zurich airport taxis on the taxi rank for your transfer from Zurich airport but you can`t be sure that there will be a taxi which suites your needs when you arrive because if you travel with more than 3 people, for example with 6 or 7 persons you will need a bigger car, a van/ minivan 8 or 9 seater Volkswagen, Mercedes Vito, V class, Opel, Renault Traffic or similar. You can call any taxi company at Zurich airport before your travel and pre book a taxi. The good thing is when you pre book, you can ask for a fixed price may be a much better price than with the taxi counter per kilometer. You can ask that the driver should pick you up in the arrivals holding your name plate so you don`t have to search for your driver. A limo service Zurich airport is a chauffered (chauffeur with suit and tie) luxury limousine to or from the Zurich airport. A first class sedan for example a Mercedes S class, BMW 7 or a Audi A8. That is of course the most expensive option for a Zurich airport transfer but you can find also a private limo campany at fair rates. Contact us if we can help to find out which one. Many limo companies offer also the same service with a bigger car if you travel with more than 2 people up to 7 passengers and luggage, that can be a premium Mercedes V class or a Volkswagen Transporter, these cars can accommodate up to 7 passengers because the premium minivans from Mercedes and Volkswagen are 8 seater vehicle. A private airport limo to or from the International Zurich airport you have to pre book, the most companies have an automatic booking service. We recommend to ask for car pictures if you want to be 100% sure and if they clean the cars before any ride. The third option is a private car service to or from the Zurich airport. In Switzerland a car service is a private transportation service, that can be a sedan car, estate car a SUV or a minivan up to 8 passengers that means a 9 seater van/ minibus. If you want to book a car service in Switzerland for example a premium luxury car service you have to ask they should offer you only premium cars because if you say i need a car service for a Zurich airport transfer that means you need simple a transfer from A to B nothing special. Car Services you will find from cheap to expensive, from bad to great service. It`s a problem to find out which one but no problem at all, Switzerland Car Service offer Zurich airport car service at very fair rates and we guarantee premium cars. The other thing is, there are local companies and worldwide transfer sellers, the transfer seller are based somewhere else not in Switzerland these provide a online platform on which you can book your Zurich airport transfer. You will find Airport transfer sellers which offer private airport limo service, taxi service and Zurich airport car service but beware if you find someone with very low rates, you should ask the company if drivers work legal, if the drivers have insurance and a driving licence for passenger transportation in Switzerland. We can`t imagine how they can offer these low rates in Switzerland. If you are not sure you can of course send us an email with the offer you received and we will help you. Many many private Zurich airport transfer companies offer ski transfers to and from Zurich airport but what are airport ski transfers? Normally airport ski transfers are transportation services to and from an airport for skis and passengers. You will find also Zurich airport transfer companies which offers airport ski transfer but without skis, in this case they mean only passenger transportation to or from a ski resort. We recommend if you want to book a airport transfer from Zurich to a ski resort that you look for private transportation with 4×4 (4 Wheel drive) cars because only this cars gives you the total safety on snow. The other solution is to find someone with fair rates, without 4×4 but with snow chains in the car ready to put them on if needed. Your Zurich airport transfer you can pay with different payment methods, some companies offers all of the options and some only a few of the below listed. 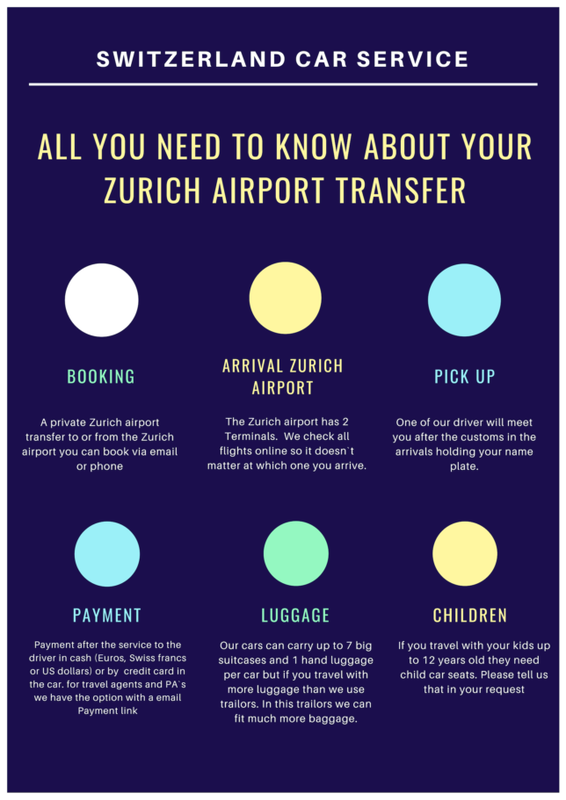 Check out our infographic about our Zurich airport transfer and if you still have questions before your booking we are here to help.